On Sunday, 22nd November, Lux presented a talk to the students of the American University of Sharjah (AUS) on the IFoA’s Certified Actuarial Analyst (CAA) qualification. 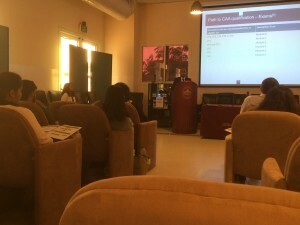 The purpose of the presentation was to create awareness of the CAA qualification, the actuarial profession in general and the actuarial industry in UAE. Students were particularly interested in understanding the roles played by an actuary and the skill set an actuary must possess. They were also keen to know in which industries actuaries can find jobs as well as the scope for actuarial science in the UAE. Shivash Bhagaloo highlighted the growing significance and recognition of actuaries in the GCC and in UAE particularly, due to regulatory changes in the insurance industry. This helped clear the misconception that actuarial science is an irrelevant profession in this region as it was a concern among the students that they would not be able to find jobs. Dr. Guillaume Leduc, an Associate Professor at AUS, expressed interest in contacting the IFoA to discuss the possibility of an exemption agreement between AUS and the Institute for the exams offered by the IFoA. Dr. Leduc was also keen on getting in touch with actuarial employers in the region in order to aid students who wish to enter the industry upon graduation. Lux offered to help bridge the gap between employers and job seekers in the UAE.